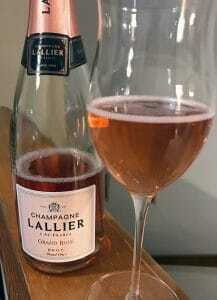 A few quick thoughts on the non-vintage Lallier Brut Rose Grand Cru. In the 2018-2019 edition of his Champagne Guide, Tyson Stelzer notes that while Champagne Lallier is a relatively young house, founded only in 1996, the roots of the Lallier family in Champagne dates back 5 generations. In 1906, René Lallier inherited Champagne Deutz with that house staying in the Lallier family until 1996 when Louis Roederer took over. The family soon after started their namesake domaine in the Grand Cru village of Aÿ and hired Francis Tribaut as chef de cave in 2000. When James Lallier decided to retire in 2004, he sold the estate to his winemaker with Tribaut taking Lallier from a production of 50,000 bottle to around 400,000 bottles today. The rose is 100% Grand Cru made of 80% Pinot noir sourced from Aÿ and Bouzy and 20% Chardonnay sourced from Avize. The rose is produced in the saignée method where instead of blending red Pinot noir wine into a white base, the must sees a short period of skin contact for the red grapes with the juice bled off and primary fermentation initiated. This method of rose production is not common in Champagne though houses like Laurent Perrier, Jacquesson, Larmandier-Bernier and Francis Boulard are notable practitioners of this style. The wine spends 24-36 months on the lees before it is bottled with a dosage of 9 g/l. Around 600 cases are imported to the US. The blood orange notes in this Champagne are delicious! High intensity nose of strawberries and blood oranges. There is a subtle spiciness as well. On the palate, the Champagne has a lot of weight and silky mouthfeel. Very fresh, vibrant acidity enhances the minerality and gives lift to the wine. The red fruits carry through but the gorgeous blood orange is what persists the most through the long finish. A delicious Champagne that is the complete package. Beautiful nose, weighty, silky mouthfeel with vibrant fruit and minerality. It is well worth its $45-50 price tag and easily outshines rose Champagnes that are in the $60-75 range. Tagged aurent Perrier, Avize, Aÿ, Bouzy, Chardonnay, Duetz, Francis Boulard, Francis Tribaut, Grand Cru, Jacquesson, Lallier, Larmandier-Bernier, Louis Roederer, Pinot noir, Rosé Wine, saignée, The Champagne Guide, Tyson Stelzer.